If you own a commercial facility, you definitely need to consider things like security. Good locks, adequate lighting and a robust security alarm system are all part of a good security plan, but your strategy should also consider an access control system. Access control systems can provide the sort of perimeter security you need to protect not only your staff and customers, but also your property and equipment. With the right solution installed, you can remotely monitor who enters and exits your facility, activate electronic locks, and arm or disarm the security alarm. Also, you never have to worry about employees losing physical keys, as all security is done electronically. With that said, there are various different kinds of access control systems that you should be aware of — if only because understanding what’s out there will help you to choose the right setup for your commercial property. So read on for a look at three types of access control systems that are available. Card Access Control SystemWith this type of access control, you and your staff will employ special access cards to access the building. These cards, which serve as electronic keys, will be unique to each user, so you’ll know which workers access the property at which times. Access cards are similar in size to bank cards or credit cards, so they’ll be easy for you and your staff to carry around. These systems can also use Keyfobs, which work the same way, but are smaller and can be attached to a keychain. Simply presenting these cards to the access control card reader will unlock the door. Keypad/User Code Control SystemWith this type of access control, a numeric keypad will be placed at each door, and an appropriate combination must be entered before the door will unlock. This is similar to how a security system is armed and disarmed. With these systems, each user is given a unique code so that you can tell who is access which doors, and when they did it. These keypad can also be used in conjunction with a card reader (or as a combination unit), where a card AND code are required to unlock the door. This is known as “two step” authentication, and is typically used for higher-level security applications. Biometric Access Control SystemThis sort of system uses features unique to your body to lock and unlock doors for the access control system. Rather than a card or code, items such as fingerprints, handprints or retina scans can be used to gain access to the secure facility. These systems are also used for higher security applications, can come with issues you need consider such as how the biometric data is stored for privacy reasons. Access control systems can be an important part of any company’s security strategy. With the right solution you’ll be able to secure your workers and your business interests by limiting access to authorized parties, and knowing who accessed what areas and when. Nice post! It is very interesting and informative as well. 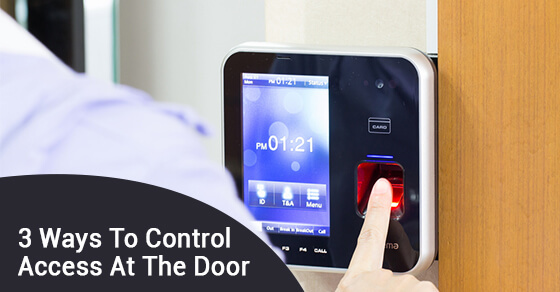 Access control system is the best for home security. Thanks for the post! Nice one! I liked it so much. The biometric access control system is the best way to door access. Thanks for the post!